LASERIUM® - Rooftop Summer Downtown L.A.
LASERIUM® - Live Laser Concerts outdoors on a rooftop in Downtown Los Angeles! MUSIC FOR YOUR EYES - Experience multiple state-of-the-art lasers and breathtaking laser effects and projections to celebrate the legacy and visual music that is uniquely Laserium®. 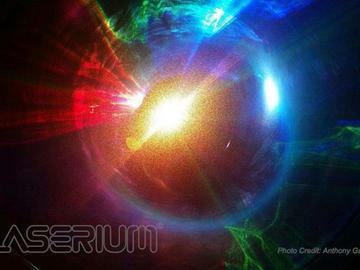 DOUBLE FEATURE - 2 full-length LASERIUM® shows will play back to back, with an intermission. Shows and titles subject to change. DRIVE UP - The first 30 cars to arrive at the gate, AFTER 7:00pm, will be admitted up into the venue to watch the shows from your car, using your FM radio for your own audio environment. Vehicle line-ups not permitted on 4th street. BRING chairs or blankets, an astro-turf area will be available as well. The sound will be at medium levels. For audio at your desired level bring your own FM radio and headphones. TAKE AWAY what you bring; please help us clear the venue after the shows by disposing of any food or beverage containers that you bring. Gourmet Pizza will be onsite, come hungry! Laserium starts at 8:30pm sharp! No refunds or rainchecks. The show is on; rain or shine. Shows and showtimes are subject to change.